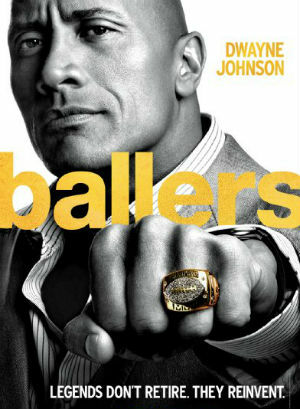 Just caught HBO's series premiere of Ballers, starring Dwayne Johnson. If you saw the 1996 Tom Cruise movie, Jerry Macguire, this is the serious serious version of that flick, using a financial adviser rather than a sports agent, but with a really good looking star. The outline for the show says "A series centered around a group of football players and their families, friends, and handlers." Ballers on HBO is executive produced bu Mark Wahlberg and Dwayne Johnson which is one heck of a combo, what with Wahlberg's track record of producing shows, and Johnson, whose production record includes The Hero, Snitch and a few more, I have a good feeling about where this series can go? Wait, do I ask you say what has Wahlberg, ol' Markie Mark, produced? Wahlberg has 22 productions to his credit, including In Treatment, Entourage, How to Make It in America, Boardwalk Empire on TV, and on the silver screen, Contraband, The Fighter, Broken City, Lone Survivor, and The Gambler. The cast of Ballers include Dwayne Johnson, Jazmyn Simon, Donovan W. Carter, Rob Corddry, Troy Garity, Omar Benson Miller and John David Washington. The premiere episode starts out with us watching Spencer (Johnson) waking up from a demon that haunts him frmo his football career, We follow Spencer through his and a few other character's day. Spencer has his hands full as a financial adviser with a few of his football player clients to clients-to-be. Between youthfully blowing through all their money or beating down on people because of things they say. Spencer has his hands full. The premiere episode was not quite like the teaser trailers for the series. The teasers showed the skin, the big smiles, the brighter side of of the life. But the series is much more serious in its focus, at least in the premiere episode. This is not a ding but just an observation. I enjoyed being drawn into the story and watching what Spencer had to do to keep or get these guys in line. And if you like seeing Dwayne Johnson, this show showcases his ability to deliver a serious depth to a character while looking good in and out of suit shirts and outfits. All in all, I enjoyed the show and look forward to following it up in subsequent episodes. But this show will be good for those who like this genre subject. Some say this is the continuance of Entourage, but in sports. It is boys being boys with the smarter boys helping the rest get through the day in their over-priced, privileged lives. This could be good, and dark, all at once.